It's Summer Time And Your Dog Can...Overheat! How about some water, Parental Unit? Today is the first full day of summer in the northern hemisphere, and you know what that brings besides lots of outdoor fun? Yes, both humans and canines can get overheated and possibly suffer heatstroke or hyperthermia. To refresh your memory on prevention, symptoms and emergency measures to take regarding canine overheating and heatstroke, check out this excellent article from PetMD. 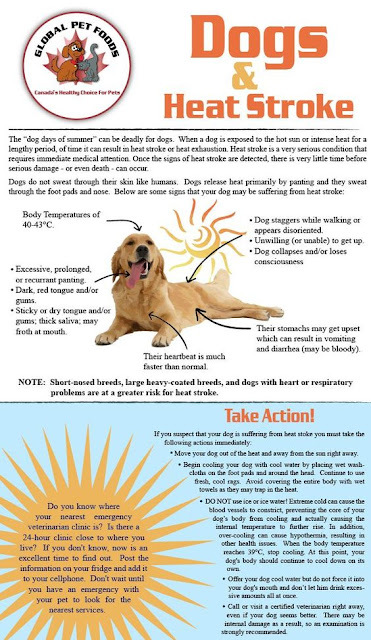 And to visualize what happens when a dog overheats, this infographic created by Global Pet Foods, will help you prepare, prevent and treat a dog nearing or suffering from heatstroke. Parental Unit was worried about me the other day because I was panting extra hard after a long walk in the park on a particularly hot day. I did have water, so she didn't think it seemed right that I appeared so overheated. But then again, she wasn't wearing a fur coat. I cooled down real quick in the air-conditioning, but she's going to ask the vet just the same. What do you do to prevent your pooch from overheating in hot weather? We'd love to hear your strategies for keeping Fido cool! We can already tell that Mackie doesn't like the heat. He'd rather stay inside where it's cool than play outside with me. What a woos! We are pretty careful with Ruby. Also, because she is a light-colored dog there are added skin cancer risks. In his final years, Pip wore a cooling vest while he was outside in the summer, which worked very well. P.S. : We are visiting Best Friends right now. It's amazing - you must visit some day!